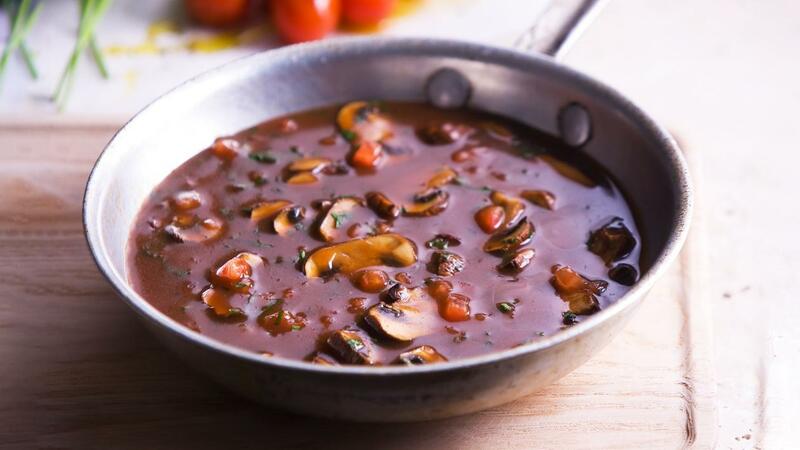 A French classic sauce, perfect for steak or poultry. Add to your menu in addition to your Dianne and pepper sauce to keep your sauce menu inspirational. Lightly sauté onions in the oil without colouring. Add the mushrooms and cook until golden brown. Score and remove the stem off the tomato, place into a pot of boiling water until the skin begins to split, remove and place into cold ice water to prevent from cooking any further, remove from the water then peel tomatoes. Whisk the KNORR Demi-Glace into hot water; bring to the boil while stirring continuously. Reduce heat and simmer for an additional two minutes. Add the diced tomato (concasse), chopped parsley and finally mix in the butter until the sauce becomes glossy. Remove from heat and keep hot. Perfect for Char-grilled Steaks and Oven Roasted Chicken, Lamb and Game.